Our family spends a lot of time in Brimfield during show weeks. I always start out with the best of intentions to make food ahead of time and bring it with us each day. That usually doesn’t last very long and we inevitably end up eating food we can buy at the show. Of course we have our favorites. It’s no secret that we love BT’s Smokehouse. We were pretty sad when we found out Brian Treitman had decided this would be his last year in Brimfield. Over the last few years, Brian has gone from just that guy who makes amazing food to our friend who makes amazing food. We will miss having him around at the shows, but we are locals so we can eat his food all year long (and we will!). 10th and final May setting up at #brimfield it’s been a good run, but 2016 will be the last year for B.T.’s at the antique show, and most likely the last year we do full service catering. But this is where it all started and it’s been pretty amazing. For those of you that are only in town during the May, July and September shows, just keep in mind that it won’t be there forever. If there’s a line, it’s worth the wait. And if you don’t end up getting some at the show, you can always stop at the restaurant in Sturbridge when you are done shopping. It’s BYOB so don’t forget to make a quick stop at Rapscallion Brewery for some beers to go! Another staple for us is Hearty Eats. They have a brick and mortar location in Shelburne Falls, MA but their truck has been in Brimfield for several years now. The freshness of their food is remarkable and they use local organic ingredients. You don’t even feel like you are eating healthy because it’s so amazingly good. I can’t decide if the falafel or the thai noodle salad is my favorite but no matter what you get, you will not be disappointed. We also would not survive our weeks in Brimfield without Vinnie’s Pizza. My girls live on it (I promise I feed them a more balanced diet the other 48 weeks of the year!) and the owners could not be nicer. We lived in NYC for 8 years so we know a good slice of pizza when we have one and this pizza is good! And don’t miss their amazing breakfast pizza in the morning. What more could you ask for? Then there is the classic Brimfield Pilgrim Sandwich. There’s not much to be said besides it’s awesome and it’s totally worth the wait. A little salty and a little sweet with the perfect amount of mayo. The guy who makes them is also so nice and personable. Earlier today he told me how hard doing Brimfield is at first. He said he has no idea why he came back after his first show because it was so bad, but he did and now his sandwiches are iconic. If you have never had one you really should. If you have had one, you probably want another one! Say Cheese showed up at Brimfield last year with gourmet grilled cheese sandwiches. It’s operated by Teri and Remy, a mother/daughter team out of Worcester, MA. I know I keep saying everyone in Brimfield is nice, but these two seriously could not be any nicer. They always have a smile on their face, they are so friendly to their customers and they love what they do. Each sandwich is made to order and the flavor combinations are unique and delicious. 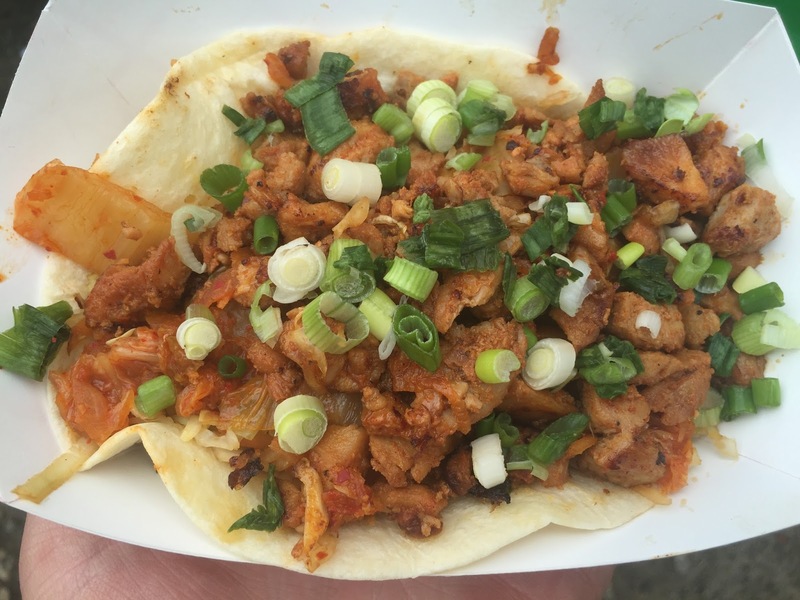 Happy Taco also made their Brimfield debut last year. They offer Baja Fish, Saigon Pork, Grilled Chicken, Carne Asada and Ground Beef tacos. It’s operated by a sweet couple from Gloucester, MA (which is where they get the fish for the fish tacos) and the food is really fresh and good. 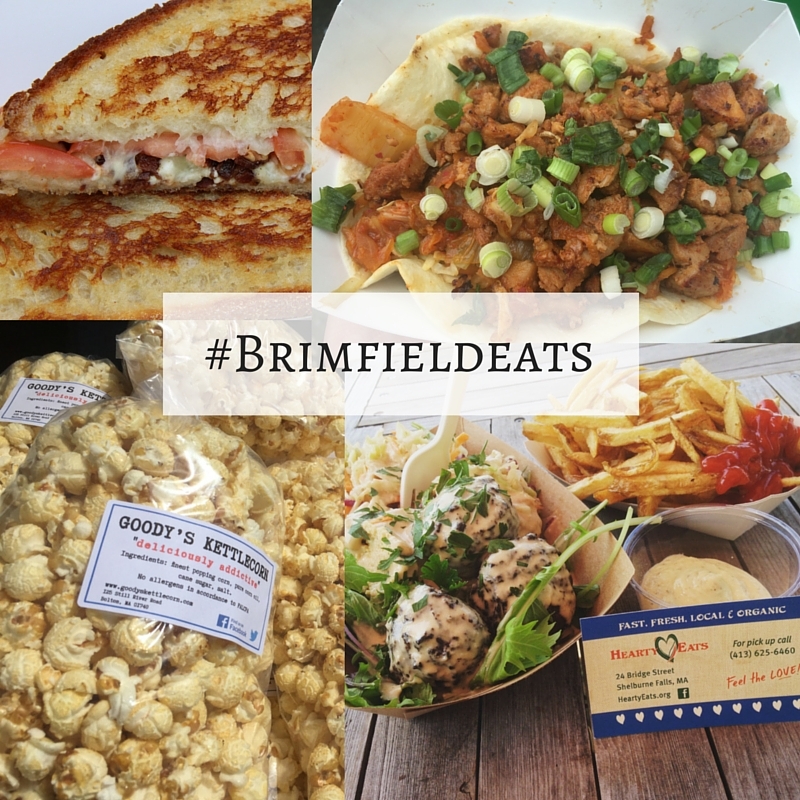 At first glance, it may seem like the food options in Brimfield are typical fair food. But The Happy Taco is one of many examples of great food made by people who really care about what they do. In addition to lots of good meal choices, there are plenty of snack options. Kettle Corn happens to be one of my favorites. 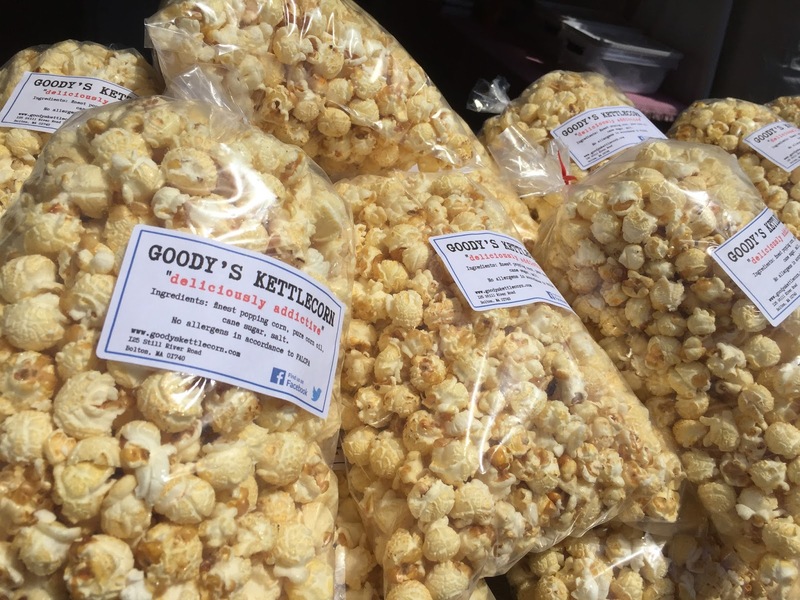 Chances are, if you have walked by the Goody’s Kettle Corn stand at the Sturtevant’s field, you met Goody. He likes to talk to people about his kettle corn and he swears it’s the best around. I have to agree with him. It’s lighter and less sweet than most kettle corn and he cares about the ingredients he uses. Want a sample? Just ask him! The May 2016 show is his first Brimfield and we really hope he sticks around! We cover a lot of ground during the show. From one end of the show to the other. Earlier this week, we happened to be down by the Brimfield Barn and we spotted another new food truck. Sun Kim Bop. The only right thing to do was to sample everything on the menu. You know, for informational purposes. We were really impressed. They offer a Bop Burger (seasoned rice buns sprinkled with dry seaweed and sesame seeds with sautéed homemade kimchi, pork, beef or chicken in the middle), Korean BBQ Wrap (Small size wrap with Korean beef and vegetables) and dumplings. It’s not centrally located in the food court area but it’s close to a Budweiser truck serving beer and depending on the time of day, it might be nice to avoid some of the longer lines at the more centrally located food places. We found out a few weeks ago that there was going to be a poutine truck and my French Canadian husband was pretty excited. The Poutine Gourmet has lived up to his expectations. The fries and cheese curds are great and even though we were skeptical about the vegetarian gravy at first, it’s actually really good too. Finally, Chompers is another new truck at the May 2016 show. They offer crunchy balls of goodness. Want to know more? 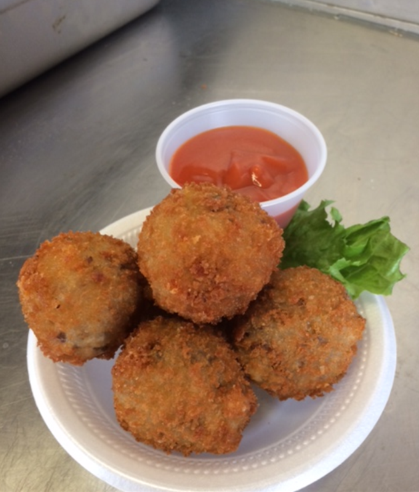 Well, Beef Chompers are little fried balls of smoky bacon, ground beef and cheddar cheese served with a sweet ‘n’ tangy ketchup. Chicken Chompers are little fried balls of chicken parmesan with fresh basil and mozzarella cheese, topped with parmesan cheese and served with marinara. If they sound up your alley, you will love them! So there you have it. This is not a full overview of all the food options at the show by any means. The food court at New England Motel has lobster rolls, sausages, burgers and much more and there are other food trucks and stands sprinkled throughout the show on most of the larger fields. We will try to cover some of the other food in later posts but if you are coming to the show this weekend, I hope it gets you excited about some of your options! We would love to know what you are eating at the show, so use #brimfieldeats and tag us to let us know what you think!